To pave or not to pave? That is the question that was danced around by County Engineer Mike Fletcher and County Manager Joe Pritchard, with interest, at yesterday morning's Lowndes County Commission Work Session, on agenda item 8.d. Georgia Department of Transportation Local Maintenance & Improvement Grant. County Engineer Mike Fletcher said Lowndes County was receiving from GDOT a Local Maintenance and Improvement Grant (LMIG) of $746,984.75 for FY "two thirteen". Because T-SPLOST didn't pass, the county has to come up with a 30% match, which is $224,095.43. He said there was a work sheet and project list in the board packet (which the rest of us don't get to see). Fewer speakers at the Regular Session than at the previous morning's Work Session of the Lowndes County Commission. The longest item was a citizen wishing to be heard, who only spoke for 3 and a half minutes. Up until then, the meeting took five minutes, as the Chairman noted. And everything was adopted unanimously, with little or no discussion. Here's the agenda, annotated below with links to the videos and a few notes, and followed by a video playlist. First the Chairman welcomed Leadership Lowndes. Then both sets of minutes were unanimously approved with no changes. The total for the wastewater lift station was still $38,969 with the budget impact being the insurance deductible. Unanimously approved. Six years ago the Sheriff's Dept. leased some laptops; plan was always to roll new laptops into the lease; that will be done using drug seizure funds. Unanimously approved. County Manager Joe Pritchard said they had started looking into wellness plans several years ago, $260,000 in savings in health care expenses so far; partnership with SGMC and YMCA. Commissioner Joyce Evans wanted to know how regularly it would be monitoried. Answer: quarterly. Commissioner Richard Raines moved to approve Corporate Health Partners, except instead of a three year contract, an initial one year with two one-year extensions. Unanimously approved. Joe Pritchard alluded to yesterday's presentation from Chris Park(? Clark?) recommending a change to basic life coverage, with an approximate annual savings of slightly over $10,000. Unanimously approved. Joe Pritchard had no report. Chairman Ashley Paulk noted it was 5:35, and then Ken Klanicki spoke for 3 and a half minutes, the longest item in the meeting, after which they adjourned. Valdosta, Lowndes County, Georgia, 25 September 2012. A parade of speakers not on the agenda extended yesterday morning's Work Session of the Lowndes County Commission. They spoke about the conference center, about South Georgia Partnership for Homelessness, and about health and life insurance. Commissioners heard from staff about repairs to a sewage lift station and laptops for the Sheriff's office. They vote on all these things at their Regular Session tonight at 5:30 PM. The Chairman announced guests not on the agenda. MR Systems' quote for SCADA control panel was $13,775, plus another control panel $25,194, for a total of $38,969. Utilities Director Mike Allen said making an addition (presumably of the $25,194 control panel) would save four weeks of downtime. County Manager Joe Pritchard said they had achieved $260,000 in savings towards projected $300,000 savings in health care expenses. He introduced Chris Park(?) with Park(?) Group and Jack Curtis with Corporate Health Partners. 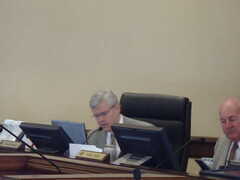 Pritchard said the county Wanted to add a wellness program to improve employee quality of life and wellbeing. Chris Park(?) spoke first. He introduced Jack Curtis, who spoke about a wellness program proposal. Chris Park(?) spoke again, saying what he was proposing would save $10,000 or 23% over the current plan while preserving all the current benefits. Joe Pritchard had no report, so they adjourned. That's only for the Regular Session. Videos by Brandon Livingston for Lowndes Area Knowledge Exchange (LAKE), Valdosta, Lowndes County, Georgia, 24 September 2012. Repairs to a sewage lift station, laptops for the Sheriff's office, and health and life insurance. I'll bet this morning's Lowndes County Commission Work Session will be brief. Mr. Clark stated that the Bevel Creek Lift Station rehab came in under budget enough to cover the additional $26,000.00 from the Exit 22 project. The Commissioners (of whom only Joyce Evans is still or again on the Commission) proceeded to approve one of their famous transportation change orders. Bevel Creek discharges into the Withlacoochee River in north-central Florida. Since Bevel Creek doesn't join the Withlacoochee River in Georgia, it's considered as a separate watershed basin for Lowndes County. WORK SESSION, MONDAY, SEPTEMBER 24, 2012, 8:30 a.m. REGULAR SESSION, TUESDAY, SEPTEMBER 25, 2012, 5:30 p.m.